Earlier the College organized Maharashtra State Level Moot Court Competition and hosted regularly every year. Encouraged by the success, response of the students and growing need, the College ventured to start M.P. Law College National Moot Court competition from 2000. Moot Court Association is established with object to organize conduct and promote the Moot Court activities of College. It consists of student and teacher member which encourages and nourishes the Moot Court activity in the College. 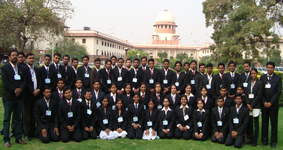 College regularly organized various moot Courts, workshops and training camps. 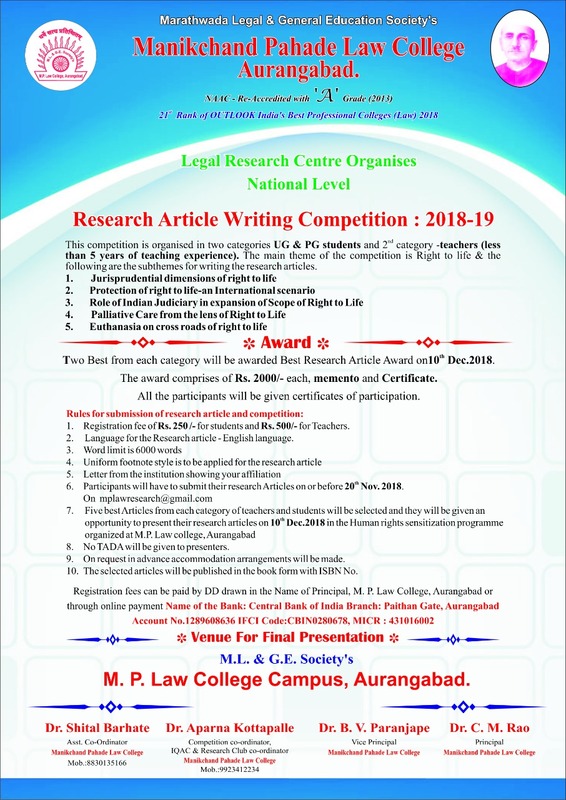 Every Year the College arranges and invites eminent Judges/Jurists and renowned advocates to deliver series of Lectures on the matters of current legal importance. Legal Aid Clinic established by college provides free legal aid to poor and needy people. College also carries on legal awareness and legal literacy programmes. motto of the NSS to imbibe social service value among the students during the completion of their legal educational course. If the students render their social services by seeking admission in NSS at par with their legal education courses and completes two years with 240 hours and at least one special camp adds 10 marks for NSS which shall be reflected in their final mark sheet. College gives intensive practical training in subject like Moot Court, Drafting Pleading, Legal Aid and Professional ethics. Record books for these practical papers shall be provided by the college which students shall purchase on payment of prescribed price. 6. College also arranges for campus interviews placements for the students. a. American Information Resource Centre, Mumbai. b. Asian School of Cyber Laws. c. National Legal Services Authority. d. The Institute of Company Secretaries of India. e. "Dakhal" the local N.G.O. Sexual Harassment of any type is prohibited in the college. The college has established cell for sexual harassment at work places. 10. National Power Point Presentation Competition. This Competition was started with a view to encourage self learning and also to use technology to make teaching learning more effective and meaningful. This Competition also tries to sensitize the students towards various socio legal issues and encourages them to think on solutions. 11. Commarative lecture on foundation day. 12 The Samvidhan Sandesh Rally. The College has initiated the 'Samvidhan Sandesh Rally' on the occasion of Republic Day on 26 January every year since 2010 with an objective to develop the Constitutional Sensitivity in the personality of law students AND to make the people aware about the Constitutional Values, Ideals, Philosophy and Provisions. In this rally students exhibits the hoardings/banners of Preamble of Constitution of India in Marathi, Hindi, Urdu and English languages with Constitutional and patriotic slogans during the procession in city.